Need a quick appetizer? Get ahead by using canned artichokes to make this simple, crispy topped restaurant-style appetizer. Arrange artichokes in concentric circles on bottom of 9-inch pie plate sprayed with cooking spray. 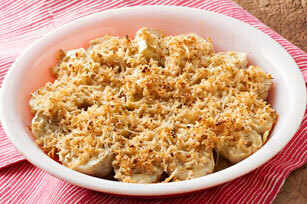 Combine cheese, bread crumbs, garlic and 1 Tbsp. oil; sprinkle over artichokes. Drizzle with remaining oil. Prepare using Kraft 100% Parmesan Shredded Cheese. Squeeze some fresh lemon juice over the artichokes before serving.